Giveaway quantities limited. Promotions are subject to change. LAKE ELSINORE, Calif. - With the Super Bowl officially marking the end to the NFL season, Storm fans can breathe a sigh of relief and turn the page to Spring Training, marking the beginning to another chapter of America's Favorite Pastime at The Diamond in Lake Elsinore. Along with a new crop of players, a first-year manager taking over at the helm, and various stadium upgrades comes a new promotional schedule featuring some Storm classics mixed in with fresh ideas and topped with an entire new look for all Thursday home games. First, let's begin with April. The Diamond will welcome the 26th season of Storm baseball on Thursday, April 11th with the traditional pregame Happy Hour kicking things off. Another reason you want to be at Opening Night: a mid-game surprise sure to leave a lasting impression. Catch any of the first four Storm home games and get your 2019 Magnet Schedule presented by Lakeside Pest Control to stay in the loop. April 25th marks the first Thursday of the year in which Lake Elsinore will fully rebrand as a participant in Minor League Baseball's Copa de la Diversión. That rebrand will feature a new name, new look, new in-game entertainment and much more. Join us again April 27th for the Team Photo giveaway, presented by Potamus Press, and get your team photo signed by all your favorite Storm coaches and players. The first homestand of May is sure to be an entertaining one, with Halfway to Día de los Muertos highlighting the second Copa de la Diversión game Thursday on May 9th. May 11th will rewind to the 1920s, when alcohol was banned by the government, but we won't abide! Join us for Anti-Prohibition Night and enjoy our stadium speakeasy, featuring classic cocktails and some traditional speakeasy entertainment. Treat mom to Storm baseball on Mother's Day, but first start the day with a special brunch in the Diamond Club on May 12th. May will conclude with the start of Hispanic Heritage Weekend. What's become a staple in the Storm promotional schedule will expand to four days, beginning Thursday, May 30th and concluding on Sunday, June 2nd. The weekend will include lots of traditional Hispanic entertainment, food and beverages, and more as the Storm will rebrand for the entire four-day theme. For the second straight season, the Storm will host a Pride Night, an inclusive night meant to make sure our community knows that everyone is always welcome at The Diamond. Exclusive Pride Night merchandise will be available at the team store. The second annual Pride Night will be held on June 8th. Bring your family out on June 9th and help Thunder celebrate his 19th birthday! Meet Thunder and his many mascot friends as they gather at The Diamond and enjoy many of his antics he's sure to have in store. GEEKend, arguably the most recognizable Storm promotion on the schedule every season, returns for its sixth edition. Nerd Out Night will start the weekend off on June 20th, with Super Power Night immediately following on June 21st. Star Wars Night will be Saturday, June 22nd. Get your Bounty Hunter Storm Hat presented by the San Diego Blood Bank. Stick around for Star Wars Night and enjoy themed in-game entertainment to go along with the hat giveaway. The San Diego Blood Bank will be at the stadium on Friday, June 21st and Saturday, June 22nd for the annual Storm blood drive. Donate blood and receive a Bounty Hunter Storm Hat without having to wait in line. Gamer Day will once again mark the end of GEEKend on June 23rd. Play some of your favorite video games on the concourse and enjoy themed in-game promotions while the Storm takes on the Inland Empire 66ers. 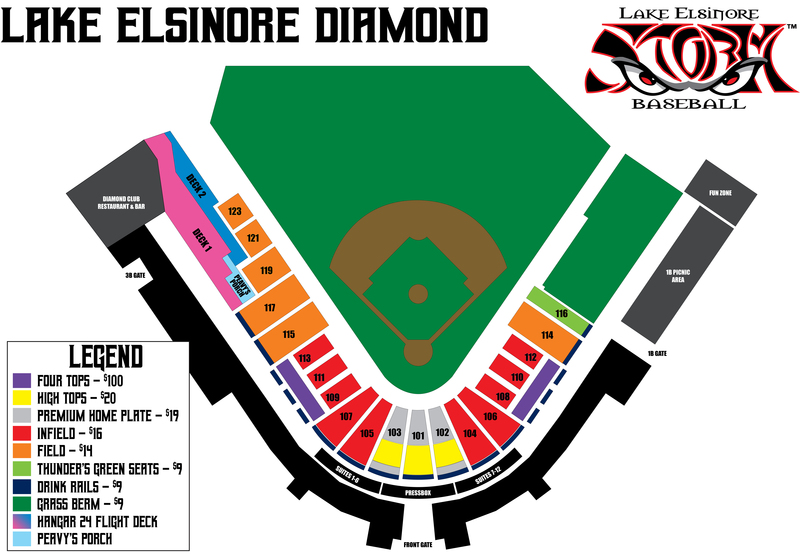 There is no better way to celebrate the Fourth of July than at The Diamond in Lake Elsinore, where for the second straight season the Storm are at home. Always one of the biggest games of the season, get your tickets early and enjoy the best postgame fireworks show in the Inland Empire. Be sure to return early on July 6th for L.E.Bron Night, highlighted by a Lakers-themed LeBron James Storm Basketball Jersey. If you choose to come to the game on July 8th, don't expect too much. That night features the traditional Nothing Night: no tickets, no concessions, no music, no in-game promotions…just baseball. FREE ADMISSION! Another staple to the promotional schedule, Faith and Family Night, returns July 19th and will include player testimonials, pastor messages and more. Come back July 20th for a Storm Car Sunshade giveaway presented by John Hine Temecula Subaru. The night also marks the first of two Boy Scout Nights of the season. We will also be auctioning off a signed Joe Torre baseball with all proceeds benefiting the Joe Torre Safe At Home Foundation. A Veterans Beer Fest will highlight July 21st and will include veteran-owned breweries from Southern California, as well as veteran support organizations in attendance. July 26th will be Menifee Community Night presented by Miles of Smiles Orthodontics, capped off by postgame fireworks. Country Night returns to The Diamond, Saturday, July 27th, for the second straight season and this year promises to be even better. With new activities, more in-game entertainment and postgame fireworks, this is a night you don't want to miss. Don't miss Thunder and Mini-Thunder: Part II on Friday, August 16th. Hawaiian Night will feature a Thunder & Mini-Thunder Double Bobble Belly preseted by HP Communications, Inc. Make sure you get to the game early to claim your Double Bobble Belly and add it to your mascot bobble collection! Celebrate the importance of community on August 17th with MiLB Community Night and get to the ballpark early for your Storm Hat giveaway presented by SHARP Business Systems. Join us on August 30th as we celebrate the 30th anniversary of the baseball cinematic classic Major League and get your 2020 Storm schedule cup presented by 7UP, because it's never too early to plan ahead! August 31st is Lake Elsinore Community Night, featuring a Lake Elsinore Grand Prix Takeover to close out the month. With only two home games in September, the Storm will hold Mental Health Awareness Night on September 1st, with one last chance for fans to get a 2020 Storm schedule cup. As is tradition, the last home game of the season is always Everything Night, where we do a little bit of every giveaway and keep our fans entertained with our best in-game promotions of the season. Single Game Tickets go on sale March 9th ONLINE ONLY. The Box Office will be open, starting on March 11, Monday-Friday from 9am-5pm for in-person purchases. 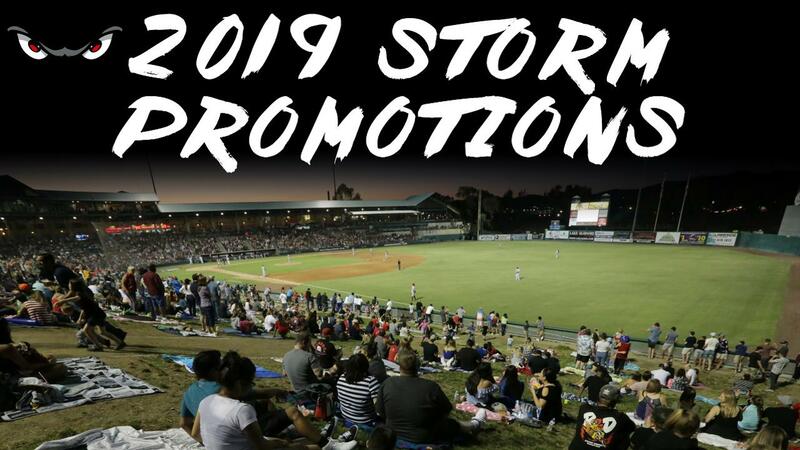 To purchase tickets online, visit stormbaseball.com/tickets..
Join your Storm front office at the City Park in downtown Lake Elsinore on March 23rd from 11am-1pm for the Copa de la Diversion logo unveil and be one of the first to set eyes on the new logo. Spend March 24th at the ballpark for the annual Sip 'N Swing event. Take batting practice on the field, get a behind-the-scenes tour, win great raffle prizes and learn all the new options Storm has to offer for the 2019 season.